Nicole Richie’s engagement ring, designed by celeb jeweler Neil Lane and featuring a stunning four-carat round brilliant-cut diamond at its center, is among the most coveted of all celebrity engagement rings. 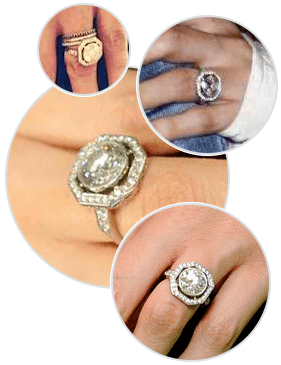 Worth an estimated $200,000 USD or more, the ring was created with plenty of input from Nicole. In an interview with People magazine, Lane said that “Nicole wanted a beautiful, special ring and wanted to be intimately involved in the design.” The process took about a month from start to finish. Nicole and Good Charlotte lead singer Joel Madden began dating in 2006, and were married on December 11 of 2010. The couple have two children together, a daughter named Harlow Winter Kate Madden, and a son named Sparrow James Midnight Madden. Like Nicole Richie’s engagement ring, this custom design from Brilliance is far from ordinary, with a brilliant halo that provides a stunning vintage look. The center diamond appears much larger than it is, thanks to the halo, and more diamonds embellish the shanks, giving this piece the look of an authentic celebrity engagement ring. Though not an exact replica of the one Nicole Richie wears, its luxurious look ensures its wearer will turn heads wherever she goes. Born in Berkeley, California, on September 21, 1981, Nicole Richie was legally adopted by Lionel Richie and Brenda Harvey at age nine. She graduated from Montclaire College Preparatory School before attending the University of Arizona, where she focused on studying Arts and Media before returning to California. Richie and her best friend Paris Hilton gained fame and popularity for their reality series, The Simple Life, in which they spend a month living with a rural family in Altus, Arkansas. The series continued for a total of three seasons on Fox, in part due to Nicole Richie’s comedic, outspoken persona, which enchanted viewers worldwide. When Nicole and Paris suffered a dispute that cast an icy pall over their friendship, the show was canceled by Fox, but a fourth and fifth season aired on E! Entertainment. Nicole is also a style icon, and has been the face of successful Jimmy Choo and Bongo Jeans advertising campaigns. She launched her own fashion jewelry line, House of Harlow 1960, in 2008, and extended the line to include shoes and apparel in 2009. Since then, she has unveiled a number of popular fashion collections as well as a fragrance, Nicole, which hit stores in September of 2012. Did you know that Nicole Richie is an award winning philanthropist and entrepreneur? She won the coveted “Entrepreneur of the Year” award in 2010, and her House of Harlow 1960 line was nominated for an award as the annual “Celebrity Fashion Line” at 2010’s Teen Choice Awards. She and Joel Madden created the Richie Madden Children’s Foundation in 2007 with a focus on helping UNICEF bring water to poor villages. Among other endeavors, the foundation has worked with Beyond Shelter, a nonprofit organization that aids homeless families in the Los Angeles area. What Our Experts Have to Say about Nicole Richie’s Engagement Ring. Nicole Richie’s engagement ring has a stunning vintage look for lasting appeal, and the overall design is a well-balanced one. The four-carat brilliant-cut diamond at its center is perfectly showcased by the halo that surrounds it, and the platinum setting ties the entire look together perfectly. This is a ring that will never go out of style, and because it is a custom design, it is very meaningful to Nicole. Celebrity engagement rings like Nicole Richie’s – especially custom ones – can cost more than the average house. If you’d like to celebrate your love in incomparable style without sacrificing your budget, consider working with Brilliance, where a team of jewelry experts will help you to create the celebrity engagement ring of your dreams. Whether you’d like an exact replica of Nicole Richie’s engagement ring or something that’s similarly exquisite but with your own special touches, you’ll find that the custom creation process is simple and fun, while the results are dazzling.